Eleven young musicians from all over the world, the “Leondari Ensemble” and friends, have been playing concerts for the last 5 years in Hydra, Spetses, Poros and Galatas during the Saronic Festival. Passion and energy are expected elements for musicians of their age, as they are all around 30 years old. Though the power they emitted at the three first concerts (31 July, 1 and 2 August) was not usual at all, even this fact given. Still much less expected, and also rare even for established ensembles, was the seriousness in every aspect: from the thoughtfulness in the selection of the repertoire, the care about detail and the finishing of every musical phrase, until the selection of the appropriate venues for the concerts and the intelligently written and essential texts in the bilingual program booklet of the festival. All this has an explanation. First of all, each one’s musician’s biography is impressing. Except from distinctions, some of the musicians are already playing in great orchestras, while others, like the excellent Canadian violinist Benjamin Bowman have made their first recordings in big recording companies. The musicians have two rehearsals, in the morning and afternoon before the evening concert, which guarantee the ensemble’s coming together. But more important: The festival takes place because of the passion of the musicians themselves, who enjoy their collaboration every summer in the beautiful Saronic landscapes, as well as because of a crucial part of the local communities, who support the festival in every way they can. The sponsorships of the German and the Canadian Embassy, as well as of Raycap, are very important but not enough. The presence of the local community, but also of many visitors was apparent in the opening concert in the excellent room of the Bratsera Hotel in Hydra. The air-conditioned hall had an excellent acoustic and was full. The audience listened carefully to two compositions, which derive a lot from folk music. The Quartet in G minor op. 25 by Brahms and the String Quintet op 97 by Dvorak. From the first minutes the warm full sound of Rebekka Markowski on her cello distinguished itself. It was even more admired in the third concert on Hydra in the Piano trio in E- flat major op. 70 n 2 by Beethoven, since the composer gives to the cello some of his most poetic musical lines. One of the most positive aspects of the interpretation of the Brahms piece was the relatively moderate speed, particularly in the first movement. Contrary to the common practice, when young musicians choose the fastest possible tempi to show off their technical competences, the Leondari Musicians emphasized on interpretation. Practically, this meant that the audience had enough time to listen to the music and “inhale” it. The stormy violinist Bogdan Bozovic in particular, lead the second movement with phrasing of rare elegance, to which Caspar Frantz answered with similar noblesse on the piano. Part of the group was also Francis Kefford, one of the festivals two artistic directors. The second one, the Greek violinist Jannis Agraniotis lead with lyricism and accuracy the Beethoven trio already mentioned. 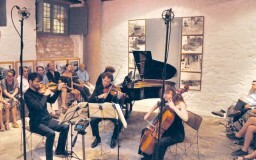 The Dvorak quintet was played twice, in Hydra and in the Syggrou Amphitheatre on Poros, the next evening. It was a distinguished interpretation, particularly in the elegant second movement, firstly because it emitted with tension the joy of life, an element, which very few composers managed to express with such an immediacy as Dvorak. But also because of the individual contributions of the marvellous Anna Blackmur (violin) and of the absolutely equal to her, Rosalind Ventris (viola), who performed the monologue in the second movement like in a dream. The qualities of her playing, were specially admired, since the viola plays a major role in this piece. Although the concert in Poros offered another surprise. The amazing Benjamin Bowman as first violin in the String quartet in E-flat Major op. 74 by Beethoven(“Harp”). His light, mobile and absolutely accurate sound, the wonderful formation of every phrase, but also the general consciousness of the structure of every part of the composition as well as his impressive control of dynamics, defined the quality of the interpretation, since Bowman was indisputably leading the other musicians. His expressiveness was even more admired in the tender melody of the lyrical second movement. In the almost overcrowded hall of the “Poseidonion Grand Hotel” in Spetses, the evening started with the wonderful Piano Concerto n. 12 by Mozart in the composer’s arrangement for piano and string quartet. Caspar Frantz on the piano defined the tempo and moved through the composition with elegance, nobility and phrases full of curves. The string quartet, with Bogdan Bozovic as first violin, offered an interesting counterpoint, through a more “classical” reading, with more austere and curt phrasing and intense dynamic contrasts. Subsequently, the “Harp” quartet by Beethoven was repeated in better acoustic conditions, while the concert ended with the Piano Trio op.70 n.2 by Beethoven, where we had chance to enjoy the intense, fascinating dialogue between Agraniotis, Markowski and Frantz. In this manner passed three of the six evenings of a festival of an impressively high level, which reveals what is possible by musicians with passion and imagination. Just a stone’s through away from Athens, where its Festival is ostentatiously turning its back to classical music, believing that there is no audience for it. An excursion to the Saronic Gulf would be enough to convince for exactly the opposite. Translated from the Greek. For the original article click here.